Does Hunter have what it takes to put down the Animal? This past Monday, RAW ended with a shocking finale to the Ric Flair 70th birthday celebrations. Instead of fans getting to see the Nature Boy walk down the ramp, what the WWE Universe got instead was Batista attacking his longtime mentor. All this just to send a message to Triple H.
The once rumored match between the two at WrestleMania, after the SmackDown 1000 confrontation is now all but official. You can bet Triple H will retaliate next Monday or at the Fastlane PPV to make it happen, allowing Batista to fulfill a long-held dream. The Animal, now a Hollywood character actor returns to the squared circle to bring full circle his career. It was a match against the Game more than a decade ago which shot Batista to superstardom, as he beat his former mentor and leader from Evolution. For Batista, this is a glorious return to the squared circle, after hitting the jackpot as part of the Marvel Cinematic Universe. With all this said and done, Batista and Triple H have our attention as the Game tries to right a wrong, as he just can't seem to beat Batista anytime they square up or even meet each other. Much like this past Monday, Batista has often always owned Triple H, as we shall see here. Evolution means to adapt or perish, is Triple H about to go down? 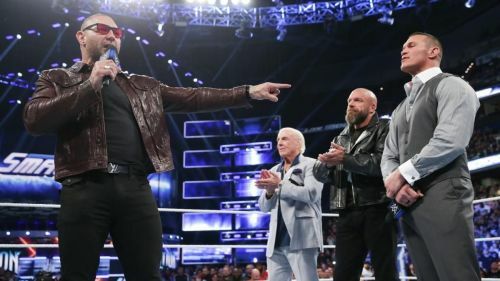 Batista's rage towards Triple H really manifested at the SmackDown 1000 show. As Evolution reunited on the brand's big night, Batista praised Triple H for all that he had done in the business. With Hunter embroiled in a rivalry with the Undertaker to finally conquer that mountain, Batista lavished his old leader with love and respect for his accomplishments. That is until the end of his touching promo, where Batista called to one accolade Triple H had yet failed to conquer. Batista calmly mentioned that Triple H had failed to beat him in his grand career, stroking the ego of the Game and felling it in all of one sentence. A masterstroke in earning Triple H's ire. 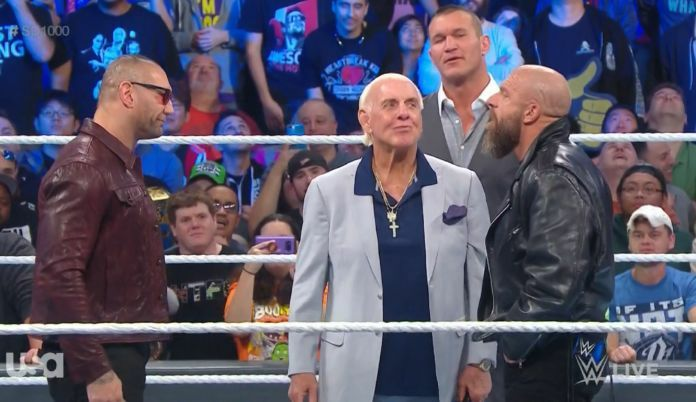 Ric Flair managed to cool the situation down between the former rivals, as Batista and Hunter made up. Yet it was clear Batista had gotten under Triple H's skin. In a fascinating double turn though, Triple H's eventual disregard of the situation seems to have bothered Batista even more. Now it's the Animal's ego calling his former mentor for a fight. The old Triple H might have retaliated but this office bred version needs to find that Game instinct if he wants to put down the rabid Animal before his bite becomes worse than his bark.